And we see the Green Mask himself! Well, his mask is green, I’ll give him that. Considering how he seems to have named himself after one small part of his costume, he could’ve just gone and called himself ‘The Red Collar’. Feel the wrath of the Blue Cape! 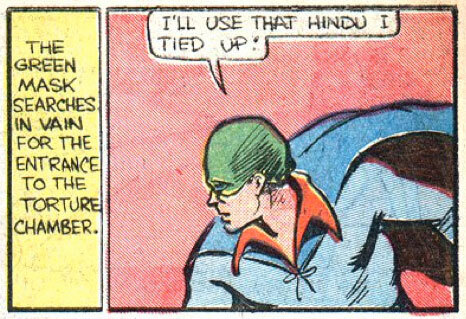 Er, use that Hindu for what? @X-stacy: I think he’s going to use the Hindu like a blind man uses a cane.